The Weekend Cookbook Challenge is upon us! I have been meaning to post something about this all week…but good gravy I’ve been busy! I am the guest host of this edition of WCC, created by Sara over at I Like To Cook. The theme for this WCC is salads – easy, flavorful, and light for those of us trying to be a tad healthier in the new year. 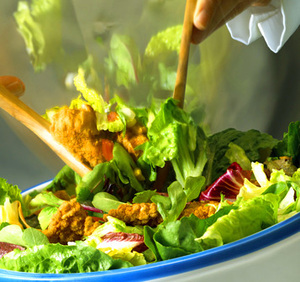 "Salad" is used very loosely – it can be a composed salad, pasta salad, fruit salad…anything! The only requirement is that you use a cookbook (or magazine that’s been sitting around waiting for you to cook something out of it) from your collection! The deadline is on Monday, March 5th (if you’re a day late, I won’t snark at you). Email the following information to runningwithtweezers@gmail.com: the permalink to your post, the cookbook or periodical you’re cooking from, your blog name, your name and location. I’ll be posting the roundup next week!